The Schwalm people wore hand-knit stockings that reached well past the knees. The stockings were held up with garters bound around the legs. In the year 1930, a poor bride would possess six to eight pairs of stockings, while the rich bride would have 40 pairs in her trousseau. 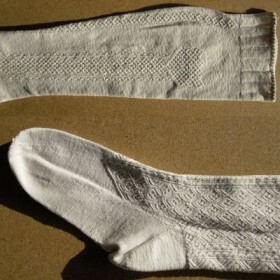 Originally, summer stockings were knit from linen yarn, later on cotton was used. 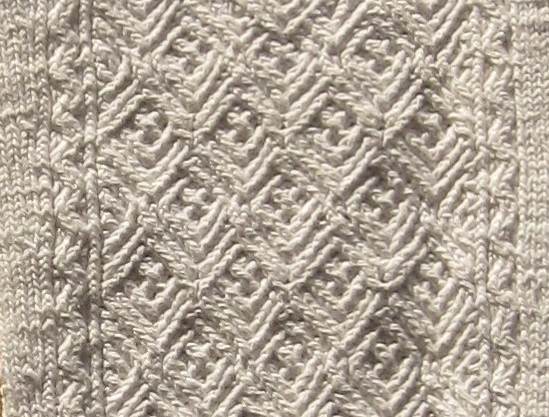 Cotton yarn made its first appearance in the Schwalm around 1830. For the Winter stockings finely spun sheep´s wool was used. The women´s stockings were white, the men´s stockings were white and sometimes dyed to blue. In order to achieve a bright white stocking, the sheep-woolen Winter stockings were bleached. Because the techniques involved were extremely difficult, only the most talented knitter or the richest women could afford this impressive kind of “Zwickelstrümpfe”. 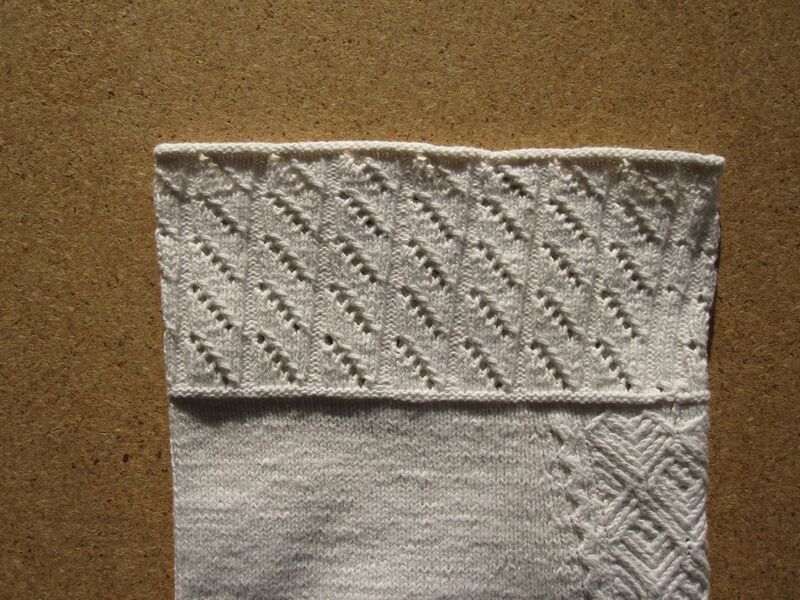 Of especial worth are stockings in which the initials or the year were knitted: here, “AKE” for Anna Katharina Ermel. 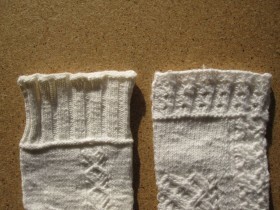 The stockings were knit in rounds, from cuff to toe, employing five fine knitting needles. They were composed of different sections. The cuff was a 5-10 cm high stripe or band. 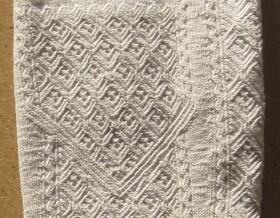 The “Börtchen” ( = small border) was knit according to the occasion for which it was meant to be worn. 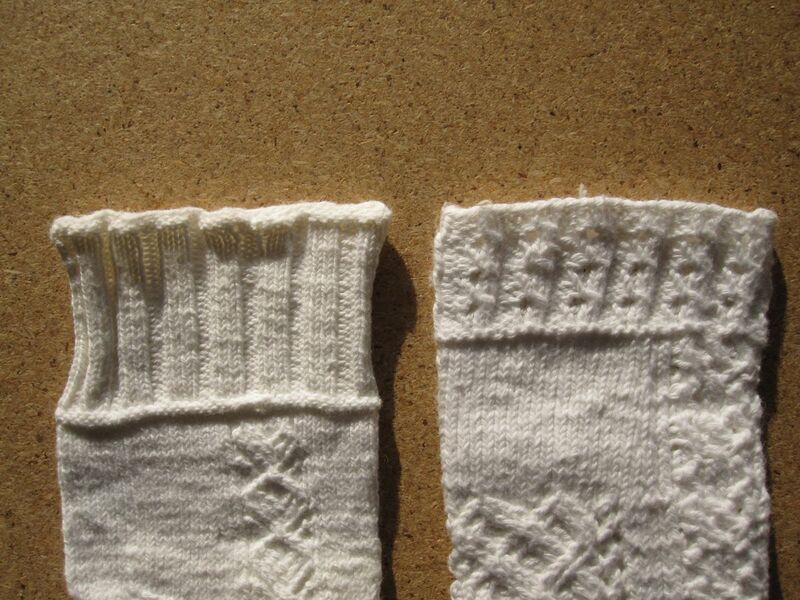 The “Börtchen” pattern might be a simple knit 2, purl 2 rib, a peekaboo or pigtail design. 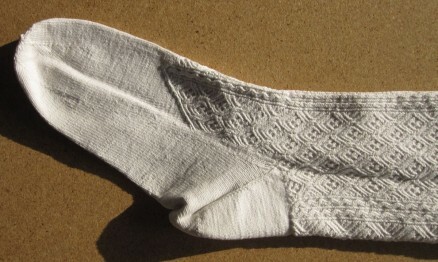 At the back of the stocking, from bottom of the “Börtchen” and down to the heel, runs a small straight pattern-stripe called “Nähtche” (= small seam). 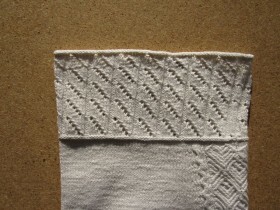 The remainder of the area under the “Börtchen” and past the knee, plain stockinette stitch is worked for a some centimeters. Now, along both sides of the calf runs a pattern-stripe, beginning with the “Platte” ( = plate). The “Platte” had the shape of a pentagon. The “Platte” was a little bit wider than the pattern-stripe below it. 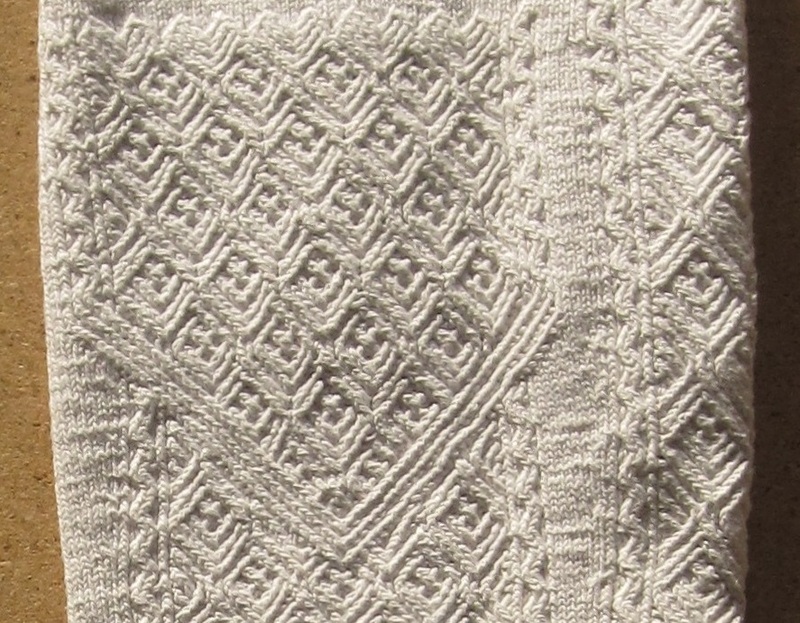 For the “Platte” there were two different possibilities: either it was made with the same patterns as the stripe below, only wider, or a large design was knit in its middle. The large design was usually a heart pattern with a small stripe, based on the stripe below, on both sides. This “Zwickelmuster” ran down to the heel. 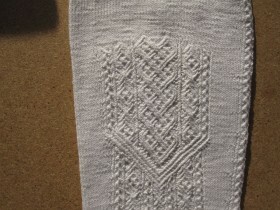 On women´s stockings, the pattern continued onto the top of the foot to the toes. This is because women wore not only the buckle shoes, but also the low-cut “Kommod” (= commodious) shoes. On the men´s stockings, the pattern ended at the top of the heels. This is because men only wore the high-necked buckle or lace-up (for everyday life) shoes or boots. On many women’s stockings a very narrow, straight pattern band with a curved pattern, called “Schlängchen” (= small snake), ran on both sides of the “Zwickel”. Between the pattern-stripes, a gusset was created so that the stocking would better fit the leg form. However, in Schwalm the pattern-stripes on the sides were called gusset, not the special shaping done between the pattern-stripes. 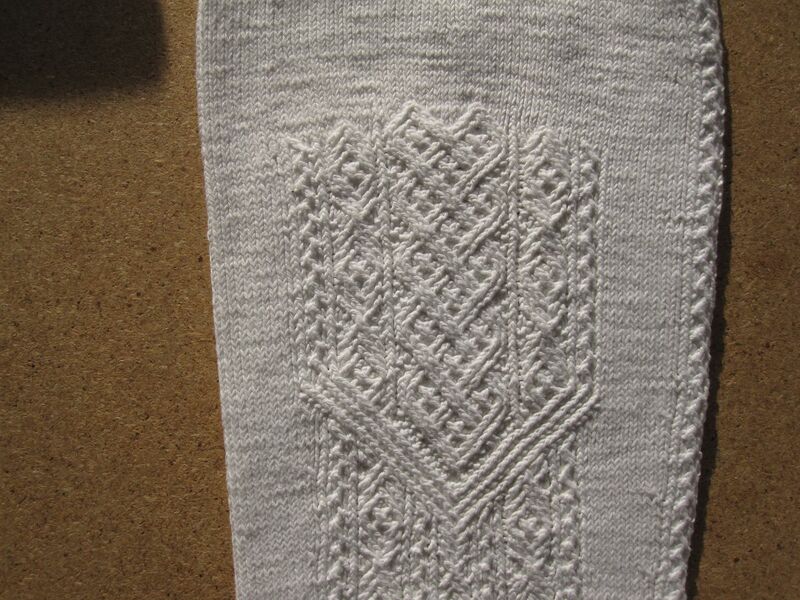 Heels, soles of the foot and toes were worked in stockinette stitch. Casting off the tip was mostly made in a star form. There are many different knitting patterns playing a role in Schwalm knitting. I will show some of them in future posts. 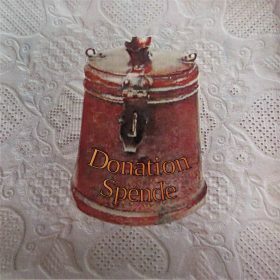 Da ich im Herbst in unserem Stickkreis die Schwälmer Stickerei erlernen möchte, hat mir eine Freundin die Adresse dieses Blogs mitgeteilt und ich bin restlos begeistert. Die Strümpfe aus diesem Post gefallen mir gut. Im Vergleich dazu stricke ich nur sehr einfache, schnelle Muster. Aber ein solches Paar würde mich auch einmal reizen zu stricken. Vielen Dank für die Impressionen und Hintergrundinfos. I would really enjoy knowing how to find the patterns used in these patterned stockings. Are there books or published patterns with the various stitches? These are lovely, I have bookmarked your site for more info as it becomes available. Yes, there is a book. It is “Schwälmer Strickereien” from Anka Becker (ISBN 3-9802008-4-1). It is German texted. But there are graphs for the different patterns. In a later post I will show parts of Schwalm knitting patterns and I will present the above book.